If you’re a lover of fish and seafood, this is an opening to add to your ‘must-visit ASAP’ list. Upon entering the restaurant, expect to be met by an extensive fresh fish counter, with everything from king prawns and langoustine, to monkfish and squid resting on ice, awaiting your selection. An import from Monte Carlo, Crazy Fish neighbours it’s meat-led counterpart, Beefbar (review overleaf) – both of which are brand-new restaurants that opened last month, brought to the region by ex-Formula 1 star, Flavio Briatore. Simply decorated, the restaurant is classy and charming with quirky, tasteful pieces of artwork on the walls, crisp white table clothes paired with nautical blues, reminiscent of the seaside, and dark wood furnishings. There’s even a spot for a DJ, who keeps the vibe intimate yet upbeat throughout the evening. To my delight when flicking through the menu, I’m informed that all fish and seafood on offer is caught daily off the Italian coast and brought to Dubai multiple days per week – you’ll not find anything farmed at Crazy Fish. Dishes on the menu really focus on making fish the star of the show, with simple cooking methods and subtle Mediterranean flavours that enrich natural tastes of the fish and seafood. The experience begins with a selection from the ‘raw’ section of the menu. Tarburish oysters start us off on the right foot, while meaty tuna tartare with crushed potatoes and basil wows with flavour and presentation – it comes served under a glass dome and is smoked lightly. The red king prawn carpaccio with pink salt is an interesting dish, and a refreshing option to see on the menu (it’s not something I regularly see). The texture is almost buttery, and it melts in the mouth – it’s delicious and quite rich. As done in Italy, the ‘middle course’ before main course, is a must. We devoured a perfectly-portioned serving of gnocchetti (mini gnocchi that comes chickpea sized), with red king prawns, cherry tomatoes and a hearty sprinkling of Sardinian Pecorino cheese (a hard-Italian cheese made from ewe’s milk). For main, the salt-crusted sea bass is simply stunning. Flambéed and served tableside, fish under the crust is cooked to tender perfection, and served simply with a selection of grilled vegetables, all drizzled with premium olive oil from Italy, of course. Ending on a sweet note, we’re pleasantly surprised to discover that the tiramisu is created next to the table, and is divine with sumptuous dollops of extra-creamy mascarpone and freshly brewed strong Italian espresso. Led by a team of predominantly Italian-natives, expect service with charm here. Attentive, but not overbearing, the front of house staff ensures your dining experience is really enjoyable. 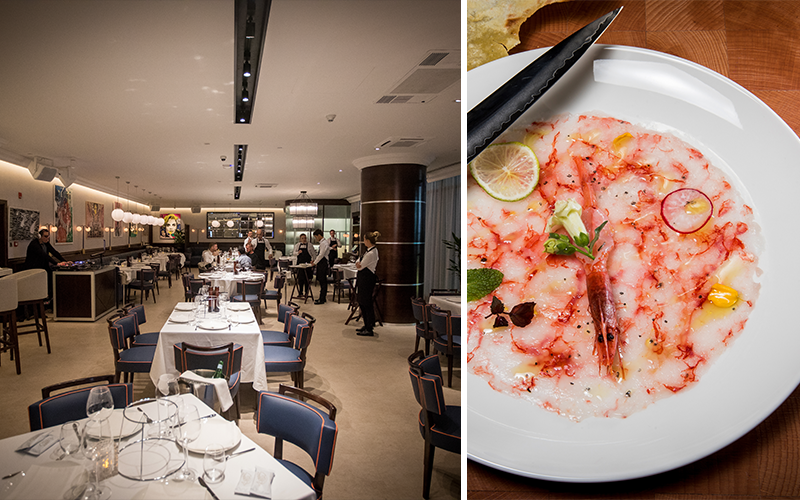 Crazy Fish is laid back and relaxed, but allows you to enjoy a refined dining experience. Beautiful, fresh ingredients, cooked simply and superbly. A great venue to share dinner with a loved one or a small group of family or friends. The restaurant is open six-days a week from 7pm to 1am, and is closed on Saturdays. Details: Around AED 390 per person for a 4-course meal per person, excluding beverages. Call 04-3529429 or e-mail reservations@crazyfishdubai.com.